Numismatists believe that this coin was struck between 500 and 480 BC. That period corresponds very closely to Artemisia I’s reign (496-479 BC). In my research, I have not come across a numismatist who attributes this coin to Artemisia I. However, since her reign occupies 79% and I believe that the A beneath the goat’s mouth is Artemisia I’s monogram, I have attributed the coin to her. Artemisia I: 496-479 BC. 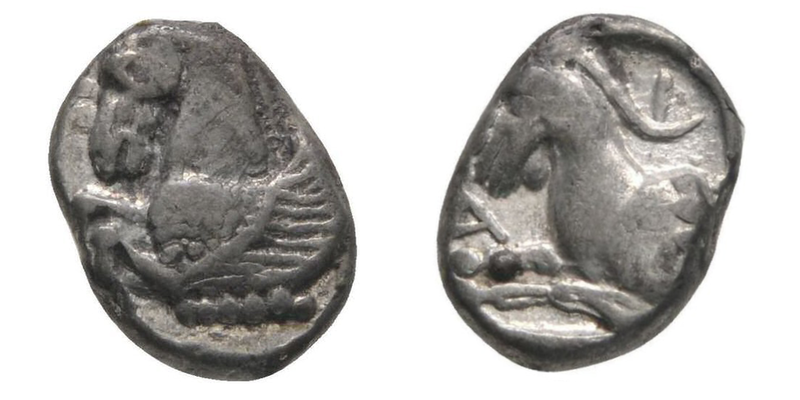 Silver Obol, minted in Halikarnassos, 7mm diameter, 0.71g. SNG Keckman 39; SNG Kayhan 757-8. Very Fine. So while there is no evidence for what Artemisia I’s banner might have looked like, I used the coin to make her banner for the novel.